We’d love your help. Let us know what’s wrong with this preview of El metodo del Doctor Aluitran y el Profesor Pluma by Edgar Allan Poe. Deux nouvelles pour trembler et sourire extraites des "Histoires sérieuses et grotesques". To ask other readers questions about El metodo del Doctor Aluitran y el Profesor Pluma, please sign up. I know Poe meant this to be funny, but it creeped me out so badly I almost quit. The atmosphere disturbed me deeply. The setting got to me. It reminded me of stories I've heard of demons dressing as a high court people of honor and dining with soon to be supper or evil, nasty trolls in human skins having a tea party and looking with lust and thirst of blood at the guest of honor. It centers on a mental asylum. This guy, for whatever crazyass reason, wants to visit an insane asylum. The people in I know Poe meant this to be funny, but it creeped me out so badly I almost quit. The atmosphere disturbed me deeply. The setting got to me. It reminded me of stories I've heard of demons dressing as a high court people of honor and dining with soon to be supper or evil, nasty trolls in human skins having a tea party and looking with lust and thirst of blood at the guest of honor. A comedic and dark short story about an unnamed narrator who visits a mental institute and partakes in a lavish dinner before things go awry. The narrator realizes alongside the reader that as his time at the hospital elongates, so does the suspicious behavior exhibited by the dinner guests, which leads to trouble. Soon, the soothing system discussed by Monsieur Malliard, the owner of the institute, comes into question. Poe does a wonderful job of interspersing foreshadowing and bits of specific A comedic and dark short story about an unnamed narrator who visits a mental institute and partakes in a lavish dinner before things go awry. The narrator realizes alongside the reader that as his time at the hospital elongates, so does the suspicious behavior exhibited by the dinner guests, which leads to trouble. Soon, the soothing system discussed by Monsieur Malliard, the owner of the institute, comes into question. I read this story in the German translation by Arno Schmidt in preparation for the uber-reading of Zettels Traum / Bottom’s Dream in which large parts deal with the translation of E. A. Poe into German. An unnamed narrator is traveling the southern provinces of France when he decides to visit a nearby private “mad-house”, called Maison de Santé, of which he heard in Paris. There he is met by the director of the facility who promises to show his guest around and to explain the treatment of the I read this story in the German translation by Arno Schmidt in preparation for the uber-reading of Zettels Traum / Bottom’s Dream in which large parts deal with the translation of E. A. Poe into German. In the middle of the story, I had a certain idea of how it might end, but it turned out I was wrong. The ending Poe had chosen was a surprise to me in that it was sort of unsurprising. Still a good story about the fine line that sometimes marks the border between saneness and madness. I already read Arthur Gordon Pym in Arno Schmidt’s translation and was blown away by it (see my review here). In the present story, the translator has retained himself more and the translation follows the original very closely. We find the usual Schmidt’chen quirks (& for and, 1 for a/an, = instead of a hyphen) and also the creative usage of punctuation marks, but to a much lesser extend than in Pym. Nevertheless, Schmidt was obviously very careful and sometimes even corrected/enhanced Poe’s original prose. There is no knowing what one eats, thought I to myself, at the tables of these people of the province. I will have none of their rabbit au-chat—and, for the matter of that, none of their cat-au-rabbit either. Man weiß tatsächlich nie, dachte ich bei mir, was man an den Tafeln dieser Provinzler so alles in sich hinein ißt – ich danke für deren ihr Kaninchen-au-chat, beziehungsweise für eine Katze-au-lapin nicht minder. I really wonder why Poe decided to use cat-au-rabbit and not cat-au-lapin. Maybe he was too lazy to look the word up in the French dictionary? Anyway, I think Schmidt saved the joke by putting Katze-au-lapin here. Here the undsoweiterundsoweiter should have been spelled und so weiter und so weiter, of course, but by doubling the words and putting them all together we get a far better feeling for the way the director is talking IMO. Here the speaker, very rudely, as I thought, put his right thumb in his left cheek, withdrew it with a sound resembling the popping of a cork, and then, by a dexterous movement of the tongue upon the teeth, created a sharp hissing and fizzing, which lasted for several minutes, in imitation of the frothing of champagne. Hier steckte sich der Sprecher, (ungebührlich plump, wie mir däuchte), den rechten Daumen tief in die linke Backentasche; wuppte ihn heraus, mit einem Geräusch wie ein Pfropfenknall; und erzeugte anschließend durch erzgeschicktes Zusammenspiel von Zung’ & Zähnen, ein minutenlang anhaltendes scharfes Zischen und Pfischen, das dem Brüsseln von Champagner frappant ähnelte. 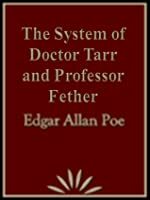 The System of Dr Tarr and Professor Fether (1845) is one of Poe's lighter comedies, although still quite black. It is an example of one of Poe's stories which he submitted to the public as an essay. 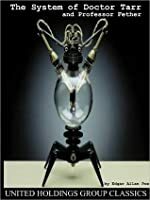 The narrator is journeying in the South of France, and is recommended by his travelling companion to visit a particular mental institution which they will shortly be passing. This institution has impressed his companion because of its revolutionary new method of treating mental illness by a so-called The System of Dr Tarr and Professor Fether (1845) is one of Poe's lighter comedies, although still quite black. It is an example of one of Poe's stories which he submitted to the public as an essay. The narrator is journeying in the South of France, and is recommended by his travelling companion to visit a particular mental institution which they will shortly be passing. This institution has impressed his companion because of its revolutionary new method of treating mental illness by a so-called "system of soothing." The narrator agrees, and on his arrival is given a guided tour of the hospital by a M. Maillard, who he has been told invented the system. This is then followed by a dinner attended by almost thirty other people, (view spoiler)[ all of whom seem to be strangely dressed and exhibiting bizarre behaviour. They describe their patients' illnesses, outrageously acting out their erratic behaviour. At this point the reader's suspicions are aroused. M. Maillard then explains to the narrator that this staff has replaced the system of soothing with a much more strict system, which Maillard says is based on the work of a "Doctor Tarr" and a "Professor Fether." The earlier system had to be abandoned because on one occasion the patients actually overthrew their doctors and nurses and usurped their positions, locking them up as lunatics. This system where the patients ruled allowed for no visitors except for "a very stupid-looking young gentleman of whom he had no reason to be afraid." The irony of this statement cannot escape the notice of the reader, and sure enough at that point the actual hospital staff break out from where they had been shut up, and it is revealed that the dinner guests were in fact the patients who had just recently taken over. (hide spoiler)] At the end the narrator still seems to be in blithe ignorance, searching in vain for any works by "Dr. Tarr" and "Professor Fether." Poe's satire was very topical. The general public were increasingly concerned with the way mentally ill patients were treated like prisoners and there were demands to reform the system. Running counter to this was the defence of "insanity" being used in court, which was thought by some to be misused on occasions, allowing criminals to avoid punishment. Este es uno de esos cuentos de Poe que apuntan al humor, sin perder el tono oscuro que lo caracteriza. Lo empecé porque alguien me habló de The System of Dr. Tarr and Professor Fether gracias a una versión cinematográfica y me interesó. A un caballero sin nombre (típico) se le ocurre recorrer un asilo para pacientes con problemas mentales. Lo acompaña una persona a la cual conoce en el viaje, pero éste se resiste a entrar y se va, lo cual demuestra un poco la mala impresión que los "normales" Este es uno de esos cuentos de Poe que apuntan al humor, sin perder el tono oscuro que lo caracteriza. Lo empecé porque alguien me habló de The System of Dr. Tarr and Professor Fether gracias a una versión cinematográfica y me interesó. A un caballero sin nombre (típico) se le ocurre recorrer un asilo para pacientes con problemas mentales. Lo acompaña una persona a la cual conoce en el viaje, pero éste se resiste a entrar y se va, lo cual demuestra un poco la mala impresión que los "normales" tenían acerca de los locos. En fin, el protagonista (que también es el narrador) llega al chateau y ahí se encuentra con el director del asilo, Monsieur Maillard. A pesar de que los hechos que se desencadenan después sean sustancialmente cómicos, reflejan bien ciertas consideraciones que se hacían sobre los alienados mentales en la época victoriana (el cuento se publicó en 1845). La locura es algo bizarro y gracioso, hasta que se vuelve peligroso para los cuerdos. Una visión bastante maniquea. Personalmente, me pareció entretenido, con muchas cosas para anotar y analizar, sobre todo sabiendo que desde hacía unos años se habían promulgado leyes que regulaban los asilos y los tratamientos. Lo malo es que tiene un final predecible casi desde el comienzo y me pareció algo estático, aunque eso no arruina la lectura. A humoursly creepy encounter at a looney bin in the 19th century. I had expected for some reason that it'll have a more ghastly finish to it but I was rather engaged, entertained and satisfied by this midnight time read. Extremely well-written, dark, comedic and deeply intriguing, it the type of horrifying excellence you'd expect from Poe. Lõbus lugu hulludest, kes valitsevad hullumaja. Hullud võivad olla ohtlikult reserveeritud, kavalad ning näida esmasel tutvumisel isegi intelligentsetena. Kui peaksid sattuma mõnda sellist asutust külastama, siis ära ole kindel, et arst või ülejäänud "hullusid põetav personal" on need kelleks end nimetavad. Soovitan kindlasti vaadata ka jutustuse põhjal tehtud filmi 'Stonehearst Asylum'. Humorous though condescending (not politically correct) look at the staff of an asylum and whether the inmates or the staff are the most insane. Good word play in the title which does not become clear until the ending. کتاب را نمی دانم، اما فیلم را که ببینید، شوکه خواهید شد، تعجب خواهید کرد، در لحظاتی وحشت می کنید و در لحظاتی لبریز از لذت خواهید شد.... .
قصه ای که در آن، دیوانگان بر تیمارستانی حاکم اند و پزشکان و روانشناسان در قفس! Excellent short story worth reading, especially after watching Stonehearst Asylum. Poe was such a genius that its mind boggling at times. I actually have never found a copy of this but just read about it in Ghostland. I probably would not be able to read it as I hate psychiatrists and other mental health professionals. Reading this part of the book where they abuse the mentally ill is hard as these things HAVE NOT STOPPED. People are such ostriches. This story is about a guy who decides he wants to visit an insane asylum, just to see what it's like and to say that he's been to one. Sounds like a fun time, huh? Of course this is a perfect topic for a short story by Edgar Allan Poe. His friend who told him about it is too scared to go, so he decides to go by himself, even though it looks pretty creepy at the entrance. He meets the superintendent at the door, who proceeds to show him around. He explains that they use a 'soothing system' to tre This story is about a guy who decides he wants to visit an insane asylum, just to see what it's like and to say that he's been to one. Sounds like a fun time, huh? Of course this is a perfect topic for a short story by Edgar Allan Poe. His friend who told him about it is too scared to go, so he decides to go by himself, even though it looks pretty creepy at the entrance. He meets the superintendent at the door, who proceeds to show him around. He explains that they use a 'soothing system' to treat their clients, which means they just let them walk around and do whatever they want. When it's time for dinner, several people arrive; they are all dressed nicely but seem rather strange. Later he finds out that the crazies had taken over the asylum and locked up the keepers. After I watched Stonehearst Asylum I knew I had to read this short story, especially after I've seen that it is written by Poe. Indeed it's a lighter book compared to his others but he knew how to keep his somber effect even through a "humorous" book...because such a cleverness (when the plot twist is revealed) can steal a few smiles from you. An original plot told in a light, whimsical manner. The story plays with the concepts of madness and normalness, as the protagonist is lead by one Monsieur Maillard through a mental asylum. You can really see what's coming in this short story, but it makes it no less entertaining. definitely a goodread if you are a Edgar Allan Poetry fan. Poe can write a comedy? Who knew? A fun read with slap in your face clues that the narrator misses. Insane asylums are the perfect locations for all manner of horror and grim tales. This isn't one of those though. This one is a funny little jab at the mental health institutions of the age, a topical subject at the time. It's funny that this was then adapted into a straight up horror thriller movie seeing as how the source material was so tongue in cheek. Definitely worth a read though. The clues are all there, slapping the reader in the face. Ok, it isn't that bad. But it kind of is. I never knew Poe wrote comedies. I think this one is a good fun comedy as the reader reads the story and thinks: ok guy are you not going to get this? are you not going to figure it out? I'll admit...I watched the movie rendition of this short story. However, I didn't know it was based off Mr Poe's story (the title is NOT the same at all). What can you do you know? This one was super, super short. I wish it was longer. There was so much more that could have been added. However, I must admit...the last page leaves so much to interpretation. Anything could have been assumed. Normally, I'm not a fan of open-ended stories, but this was pretty good and I liked it. Mmmm, not much else I'll admit...I watched the movie rendition of this short story. However, I didn't know it was based off Mr Poe's story (the title is NOT the same at all). What can you do you know? Mmmm, not much else to say. It was a nice quick read. I hate to admit it, because I'm a huge Poe fan, but I think I liked the movie better, which I'll be reviewing it soon (maybe this week - not sure yet). "The System of Dr. Tarr and Professor Fether" is one of Poe's lighter comedies, but there are still aspects of it that will make you cringe. An unnamed narrator visists an insane asylum and partakes in an all-meat dinner before things take a twisted turn. He has his suspicions about the institution while visiting, but they are not confirmed until the very end. Edgar Allen Poe foreshadows and gives specific details throughout the text to build anticipation and create a vivid picture of the hospita "The System of Dr. Tarr and Professor Fether" is one of Poe's lighter comedies, but there are still aspects of it that will make you cringe. An unnamed narrator visists an insane asylum and partakes in an all-meat dinner before things take a twisted turn. He has his suspicions about the institution while visiting, but they are not confirmed until the very end. Edgar Allen Poe foreshadows and gives specific details throughout the text to build anticipation and create a vivid picture of the hospital. However, I wish he would have given less hints about what was actually going on, because I had it figured out before it happened. In all, I found "The System of Dr. Tarr and Professor Fether" to be very entertaining and quite whimsical. I read this after watching the movie upon which it is based: Stonehearst Asylum. The written story is shorter than the movie, but I found it entertaining still. It foreshadows well, the reader gently(?) understanding along with the narrator what happened. I enjoyed it because Poe has taken the old "night in a haunted house" and changed it to a "night in an asylum". That makes it more real, shifting the reader into something more horrific because of its believability. It's old but worth reading. شفت الفيلم الأول اللي بيستند لأحداث القصة دي قبل ما أقراها. طبعا كنت متوقع أشوف فيلم رصين مش علشان إنه فيه بين كينجسلي وكيت بكنسايل، لكن علشان مستوحي من أحد كتابات إدجار آلان بو، واحد من أعظم الكتاب اللي ولدوا علي هذه الأرض. حبكة القصة رائعة بالطبع وفيها تحولات درامية كتير, الفيلم مش ماشي علي السياق الحرفي للقصة، لكن الاتنين في مجملهم رائعين جدا. this was such a weird story but even tho I know some things that the protagonist didn't I was still shocked about the ending even tho it was right there the hole time. I will say the protagonist was very dumb, all the way up to the end he didn't catch things that where going on. but it was a really good read I recommend this book its not long you will get done in no time. أثناء قراءتي للقصة لمعت في ذهني بعض اللقطات من فيلم Shutter island والتشابه يكمن في غموض كلا من القصة والفيلم وطابع البطل المليء بالشكوك ولكن طبعاً الراوي هنا صحيح العقل على عكس بطل الفيلم وعكس من معه على المائدة في المصح أيضاً . قصة جيدة ومشوقة ذات طابع يسحبك إلى مكان آخر مجنون ومريب . Незатейливая в своём абсурде история, но она будет интересна любителям Эдгара Аллана По. Прекрасный язык.